Day Starter, 60 tablets (Source Naturals) - Penn Herb Co. Ltd. 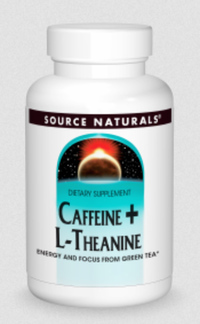 Source Naturals Day Starter™ delivers the energy benefits of caffeine with the calming benefits of L-theanine, to help you start the day focused and productive. In contrast to the nervousness that can come from consuming excess caffeine by itself, these two ingredients work together to provide calm, focused energy. Clinical research has shown that caffeine and L-theanine have a synergistic effect on attention and accuracy, and together support healthy focus and memory better than the use of each ingredient by itself. AMOUNT PER SERVING (1 TABLET): Calcium 21 mg; Green Tea Leaf Extract (50% caffeine) 200 mg; L-Theanine 200 mg. OTHER INGREDIENTS: Microcrystalline cellulose, Dibasic calcium phosphate, Hydroxypropyl cellulose, Magnesium stearate, Modified cellulose gum, and Silica. Suitable for vegans and vegetarians. Contains no yeast, dairy, egg, gluten, corn, soy or wheat. Contains no sugar, starch, salt, preservatives, or artificial color, flavor or fragrance. Delivers energy benefits of caffeine with the calming benefits of L-theanine, to help you start the day focused and productive. Each tablet contains 100 mg of naturally occurring caffeine, which is approximately the amount contained in 1 cup of coffee. 1 tablet 1 to 2 times daily with a meal. Do not take before bedtime. Caffeine can cause nervousness, irritability, sleeplessness or rapid heartbeat. If you are pregnant, may become pregnant, or breastfeeding, consult your health care professional before using this product.